The sequel to Gamelion’s SpeedX 3D arrived on eShop last week and brings a more stable experience. That said, it lacks some of the features of it’s predecessor, which is an odd move for a sequel. The game itself looks like a demo run of F-Zero/Wipeout. 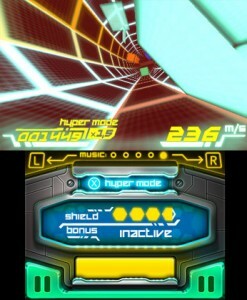 The objective is pretty much to race through the infinite track while avoiding the obstacles. As you advance the obstacles will become harder and faster and despite being a racing game, you are the only player. Combined this gives the game a Tron-like vibe. The track design has the vibe of being a prototype of F-Zero or Wipeout where half pipes make way to flatland then back to pipes again. You are able to go faster by pressing B or X, which increasing your score by 1.5x as opposed to 1x on normal speed, which will have an effect on how you decide to play it ; will you go slowly but surely or use the speed feature to get a higher score but more likely reach death earlier? They say heaven is a halfpipe…. 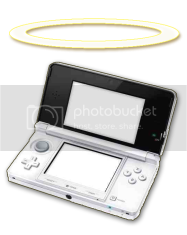 Also found on the tracks are power-ups such as shields (orange) which protect you from the obstacles should you run into them, bombs to destroy obstacles and a slowdown power-up to temporarily stop special effects. One thing that is a remarkable improvement to the original is the framerate, which is always smooth which can be beneficial to the gameplay in that it starts out slow and speeds up through out the course of a level. Back to what I was saying before about how this “Hyper Edition” is different than the previous edition ; SpeedX 3D had multiple modes and difficulties, while the sequel only has the free-run on 1 difficulty setting. Because of this Hyper Edition feels like more of an addon to the original rather than a true sequel. Indeed many feel it should have been a free add-on, as opposed to charging and making it a separate game, albeit cheaper than the original. SpeedX 3D Hyper Edition had great potential and did expand on the original in some ways, such as having a better framerate, which it trades for the greater duplicity of modes found in the original. 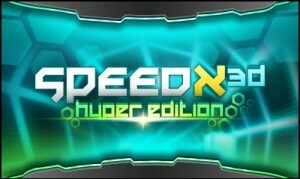 That said, for those who own the original SpeedX 3D I would highly doubt you would want to buy this unless you found the original to be laggy. Arcade gamers will get enjoyment from trying to improve their score. *Tracks change on every new game.